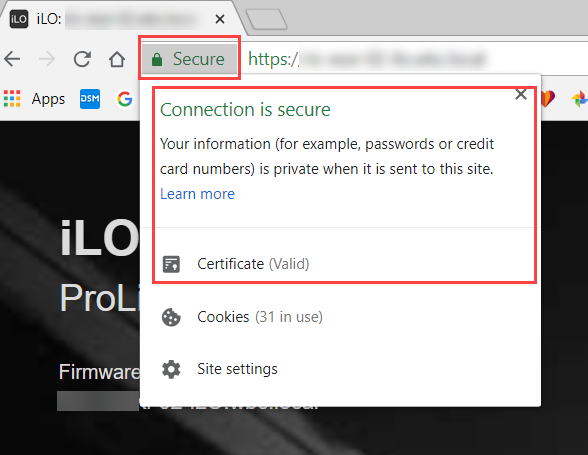 Something that has been on my list for a while to to add SSL certificates to all the various internal apps and management web interfaces so I am not just clicking through the certificate warning in the browser. You can generate the Certificate Signing Request (CSR) from the iLO browser interface but I am going to use the HPE iLO PowerShell cmdlets. I will use an internal Microsoft Certificate Authority to generate the certificate. You can see that the certificate is the default one shipped with the server, so not trusted. Generating the CSR is a two step process. First you need to start a request, wait 10 minutes, then get the CSR. To start the CSR use the cmdlet Start-HPEiLOCertificateSigningRequest and pass the usual details such as City, Common Name, etc. Copy the CSR text starting at ----- BEGIN CERTIFICATE REQUEST----- and end at -----END CERTIFICATE REQUEST-----. Open a text editor and paste this in and save as a .csr file such as ilo.csr. We now have the CSR file to generate the certificate. A dialog box will pop up asking to confirm which CA to use. Choose the correct one and then the file C:\Temp\ilo.pem is generated. This is the issued certificate. Now we have the certificate returned in the file C:\Temp\ilo.pem. We need to apply it now to the iLO. The process is very straightforward and can be completed entirely at a command line without having to login to the web interface. One thing I should advise. I tried using an wildcard certificate issued from the CA and applying it to the iLO but it didn’t like that. Seems you have to generate a CSR to get a working certificate. If I am wrong please let me know.